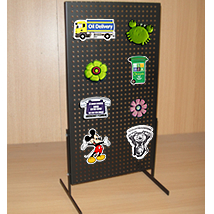 Black pegboard counter display is perfect for hanging small magnets, any hanging merchandise. Great for selling lots of small items in a small amount of space. This retail counter display will increase impulse buys, business will be booming when placing this black pegboard display at the register and watch profits start to rise. 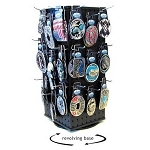 Include 4" hooks and 6" hooks on your display rack. 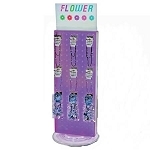 Order your wholesale store display today! Works great for our needs to present hanging products to potential buyers. I will be using these pegboards to display my spice packets. The size is Perfect for the 6ft tables we use. Clean cut and light weight, they will be used daily ! I sell Body Oils and other product in a flea market setting. My walls there is pegboard and I hang my incense from it. This year I''''m planning to do festival vending and needed something to diplay my incense vs. just lying them on my table. I knew in my mind what I wanted and was shocked when searching the web, came across the displays at Candyconcepts. They are perfect! 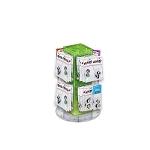 I ordered 2 and I''''m able to hang 4 packs on each display. I love the stand & the durability. Q: What size pegs does this counter top display use? 4" Long Hook For Black Metal Pegboard - 10ct.